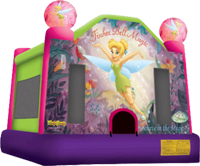 This licensed Tinker Bell Bounce House will bring the essence of Disney to your next party, with a little pixie dust. Gorgeous artwork shows off Tinker Bell spreading some enchantment throughout her flower-filled pixie land. Kids will certainly become believers as they jump to their hearts content with the fluttering branding icon of Disney. This is our 15′x15′ Regular Bounce House. This is a larger Bounce House than some of the other companies offer and don’t tell you which is a 13′x13′. There is plenty of room for running, hopping, jumping and just having a good old time. Jumping in one of our Bounce Houses is great exercise for the kids also. If you are having an adult party and need something for the kids to do not in the house, then you come to the right spot. Click the “Check Availability” button to get a Quote or to Reserve/Book online.